When conducting our training class we are always surprised to find out that our attendees do not know that we have such a wide selection of cams for the V100 and V200. VAC's most common cam is the C1 cam used in quarter turn applications because of the two lobes 90deg and 180deg. it is commonly used for quarter turn valves for direct and reverse action as well as for split ranging any quarter turn valve with the 180deg lobe. It can also be used on 3-way ball valves with 180deg rotation. Our C9 cam is one of the specialty cams that we can offer for users looking for better performance from ball and plug valves. In full port ball valves and some plug valves there is a dead angle, in other words the valve must turn a given angle before flow occurs through the valve. On one side of the cam that angle is 25 degrees and on the other side that angle is 34 degrees. The result of using the C9 cam is that with a very small signal increase from Zero the valve will move quickly to begin flow. After flow begins, the positioner will provide a linear response for the rest of the valve travel. The use of this cam can provide significantly improved control resolution when using full port ball valves and plug valves. Click here for a more detailed paper written by one of our customers about the C9 cam. There are 11 different cam options for various travel and characteristics, for a complete list of cams click here. One of the most common technical calls VAC receives is dealing with tubing a positioner for single or double acting applications. The V100 and V200 can be tubed up as double acting or single acting. When the unit is tubed up single acting the C- port needs to be plugged. Remember that on increasing control signal air is always exhausted out of the C+ port. A simple way to check to make sure that your tubing is correct with the V100 or V200 is to push down on the balance arm inside the positioner. If nothing happens when you push down, it's an indicator that the tubing is incorrect. The D400 and D500 is a little bit different. They can be ordered as single acting or double acting. If the unit is ordered as a single acting unit, it CANNOT be used as a double acting positioner. However, if you order the unit as double acting, the unit can be used as a single acting by plugging the OUT 2 port. A double acting D400 or D500 will also improve your standardization on just having one unit that can cover both single and double acting applications. All of us at Valve Accessories hope that you had a great summer and looking to finish 2014 off strong. In this newsletter we will highlight training dates, standardization opportunities, and reintroduce some specialty cams for the V100 and V200. We are always looking for subjects to write about, if you think of an idea please let us know. Email Randy Estes. VAC promotes how easy it is to retrofit any of our VAC positioners to so many different BRANDS of control valves in the field. 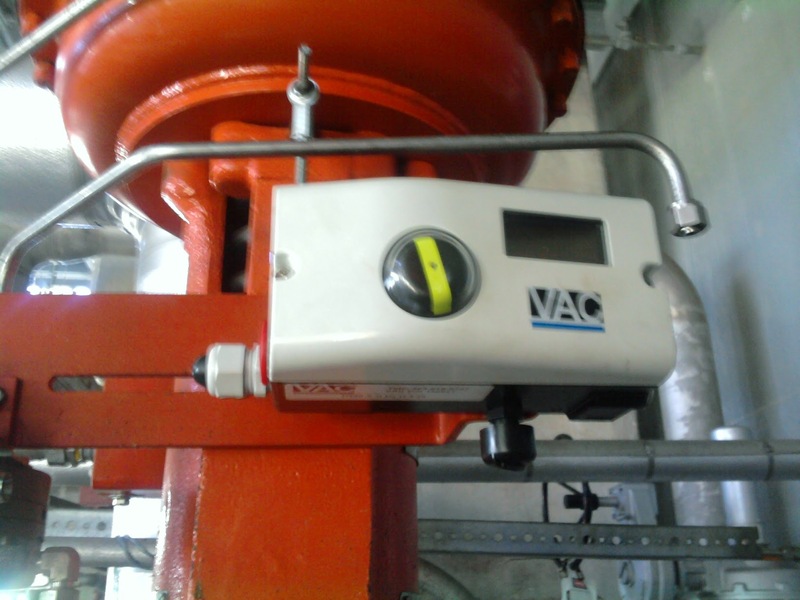 VAC just helped an end user who was having issues with a design change of a major label positioner. In this case the customer was unaware of the change from a mechanical connection to a magnetic connection. The customer was not happy with the fact that now when replacing the same brand positioner they must buy a new mounting kit, not to mention that one positioner CANNOT be used on linear and rotary valves. This user has installed several D400s and is happy with the reliability and being able to retrofit the D400 to both linear and rotary valves.This has streamlined purchasing, training of technicians, and the amount of inventory in their store room. Standardization of a plant can happen by asking the correct questions, and listening to the needs of your customer. New valve packages with VAC positioners on it is great, and a great way to get into a plant, but remember in sales we will walk by more existing positioners in the plants than we will ever sell. Our attendees from our August 2014 training class from left to right Patrick Graham with SDH Flow Control, Carl Berthold with Fair Engineering, Jaime Gamon with G&C Equipment, Ronnie Campo with Cajun Process Solutions, Bobby Brooks with The EADS Company, and Brad Welch with Cajun Process Solutions. We want to thank all the attendees for a great class and to the management at each of their respected companies for allowing them to attend the class. Our next class is already filled up for October 14th and 15th. In 2015 we will be CHANGING it up a little. We want to try having a class specifically for sales and another class specifically for technicians. The sales class will be March 3rd and 4th, we will focus in more on competition, how to sell retrofit, and general sales approach to our line of positioners. The class designed more for technicians will be May 12th and 13th. In this class we will spend more time in the shop with our hands on the unit, spending more time on troubleshooting, repair, and mounting. To sign up for either class please contact Tammie Hughes via email or by calling her at (205)678-0507.